Many people try to move their hips in a circle with the hoop. This actually makes hooping much harder. Try this: put one foot in front of the other and just shift your weight back and forth from foot to foot. It’s less of a circular hip motion and more of just a rocking or pumping motion. Now don’t I feel like an idiot. I was moving my waist in circles for my entire life and it never worked! Why do we think left to right? yea, yea! I like Tom’s idea! That would be entertaining to say the least. I can’t wait to get my hands on a hula hoop to test this technique. I have been hula-hoop challenged my entire life. That crosswalk sign photo is hilarious. It’s great how his hands are on the hula hoop. Perfectly positioned. And the feet are in the proper position as well. And the horizontal lines show the proper hula hoop technique. (swaying back and forth). All these years I though those “crosswalk” signs represented a place for people to walk when actually they are hula hoop guidelines. Kudos to our government for spreading hula hoop love. Some guy i know told me there is a website where they unveal the secret of hula hoop. I can’t believe my eyes. It is real! I heard there are many other versions of hula hoop, such as “Spin-a-hoop” and “Hoop-d-do”. If you know their secrets or techniques, do let me know. Hey, where did you find this funny sign ? “Beware, Hula-Hoppers’ area” I love it! 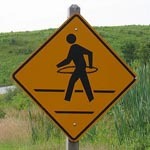 FYI: the hula hooping cross walking sign is a ‘String Cheese Incident’ logo. i believe it started at one of their shows where they handed out these hula-hoop stickers to fans so they could then go and stick them on random cross-walk signs. IT DOESNT WORK, i just tried it myself!! tried it about 100 times, gutted i cant do it, its really really frsutrating! !